With love and care I carefully and prayerfully double infused organic calendula petals in organic olive oil for one moon cycle. 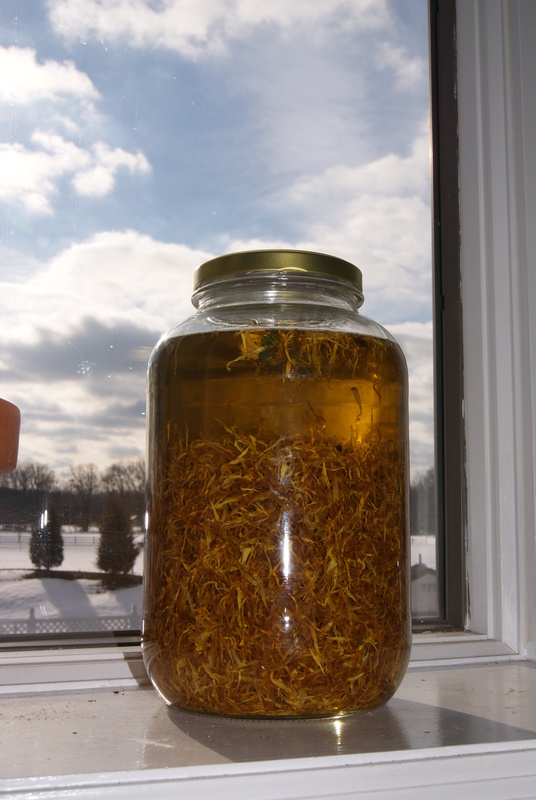 After the moon cycle I strained the calendula out and added another batch of herbs in the same oil. This makes a double-infused oil. The result is more depth and a more powerful acting preparation. The knowledge of the medicinal effects of calendula were known and written about as far back in history as the time of the ancient Egyptians. Going back that far in history, this plant gives me a deep sense of having always been a powerful mothering plant, always ready to come to the aid of all the issues of a hurting child. It is a great oil to have around for children and adults alike and is especially great for mothers at any stage. I always like to think of the words calendar, and doula when I hear calendula, in this way I can see her as a timely and loving midwife. 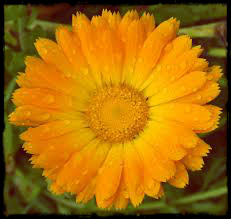 Calendula is used widely in the herbal traditions for any sort of skin ailment, even for infants. As a powerful anti-oxidant, it promotes skin healing and cell regeneration while improving the blood flow to the inflicted area and increasing tissue regeneration. Being a powerful antiseptic and anti-inflammatory it also refreshes and regenerates the skin. The oil can be used as a lotion or massage oil and it is safe to be applied around the eyes. Common uses for calendula: a massage balm for sore muscles, inflammation, achy joints, bruises, burns, cuts, wounds, scrapes, dry skin, dry acne conditions, eczema, psoriasis, dermatitis, ring worm, diaper rash, infections, wrinkles, preventing scarring, insect stings and bites, chapped skin and lips, a daily skin moisturizer.